Gardaí searched a house in the Cherry Orchard area of Dublin this morning. 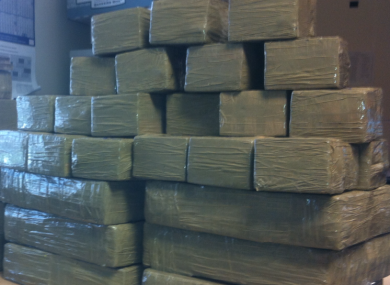 A MAN IN his 30s has been arrested in connection with the seizure of cannabis resin worth about €570,000 this morning. The arrest comes as part of ongoing investigations into the sale and supply of controlled drug in the west Dublin area. Members of the Ballyfermot Drugs unit searched a house in the Cherry Orchard area this morning, seizing the drugs and detaining the man on the scene. He can be held for up to seven days under section two of the Criminal Justice (Drug Trafficking) Act 1996. Investigations continue and gardaí say updates will be provided. Email “Man arrested as cannabis worth €570,000 seized”. Feedback on “Man arrested as cannabis worth €570,000 seized”.